We found out my hubby was gonna be in New York for 4 days and I about lost all control! There is no way I’m gonna be stuck at home for that long! Okay, hear me out, I wasn’t just throwing a fit, in those 4 days, my oldest would start his first day of school, which is about a 30 minute drive one way, he also has band practice. My youngest son had meet the teacher night plus his first day of school would be while the hubs is away! Talk about me freaking out! We got a small loan from our bank and began car hunting. We began to pray specifically for a van. It almost seemed impossible to find a van for the amount we got approved for…, we had to get it from a dealership and it had to have less than 70,000 miles or less. My husband believed we could find one, but me on the other hand had doubts. I would think to myself, It’s impossible then I would hear, “With Me, all things are possible.” One night, I was so overwhelmed b/c hubby would be leaving in less than a week and still nothing. I remember wanting so badly to believe God would bless me but I was drowning in unbelief and doubt that I couldn’t even hear Him trying to speak to me. I began praying that He’d help me believe and out of nowhere I started having thoughts of every single time God met our needs in the past. I began to speak positive and really truly believe that God was going to bless us before my hubby left. It happened on a Tuesday, 2 days before my hubby flew out, that God blessed us with our 2nd vehicle! It was a glorious day indeed! 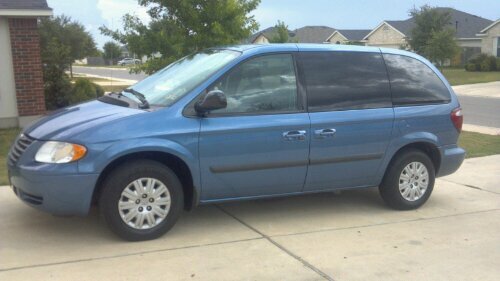 We got a 2007 Chrysler Town & Country with only 52,000 miles with the payments we wanted and we talked the dealership down about $1,000 AND most importantly it has A/C! ! This is a VERY clean van inside & out! I believe we truly got blessed! I thank God that He is so gracious and patient with me…especially bc I’ve always struggled with believing God for meeting MY needs. And once again He’s proven His faithfulness. Okay, soooooo……I named my van! I know, I know I’m goofy but that’s okay bc I’ve been known for being a weirdo! I guess you want to know her name, hu!? Okay but, don’t laugh…. Her name is: Glory Periwinkle! Isn’t that such an awesome name!?! Before you get all crazy on me let me give u the meaning of it! Glory because I give God all the glory for blessing me despite my unbelief. Here’s a pic…isn’t she a beauty! So am I really a weirdo for naming my van? Do you name your cars? Tell me crazy car names that you’ve heard of or that you’ve named your car!